Japan Airlines (JAL) is the flagship carrier of Japan. JAL’s planes and service in all cabins are consistently rated among the best in the industry. Their award program, JAL Mileage Bank (JMB), is flexible and offers some great redemption rates on flights between the U.S. and Japan. They are also a member of the powerful oneworld alliance. Aside from JAL’s oneworld partners, JMB members can also redeem from and credit their miles to Air France, China Eastern Airlines and Emirates. JMB is a distance-based program, and has different redemption rates for its own flights and for oneworld members and other partners. The charts can be found here. One shortcoming of the JMB program is that there is only one source of miles aside from actual flying: Starwood Preferred Guest points. You can transfer 20,000 SPG points or more to JMB miles at 1:1 ratio. Other than that you will have to earn JAL miles the old-fashioned way up in the air. 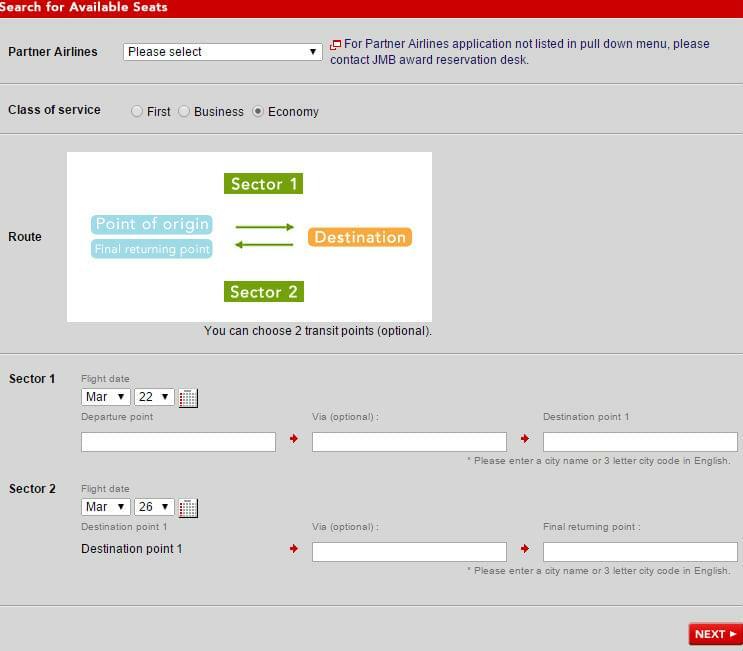 When Should You Use JAL Mileage Bank Awards? Unlike most of its peers, JAL doesn’t have “saver” and “standard” redemption rates. Typically those rates are reasonably priced and overpriced, respectively. Instead, JAL only has reasonably priced standard redemptions and seasonally discounted off-peak rates, which are simply fantastic. 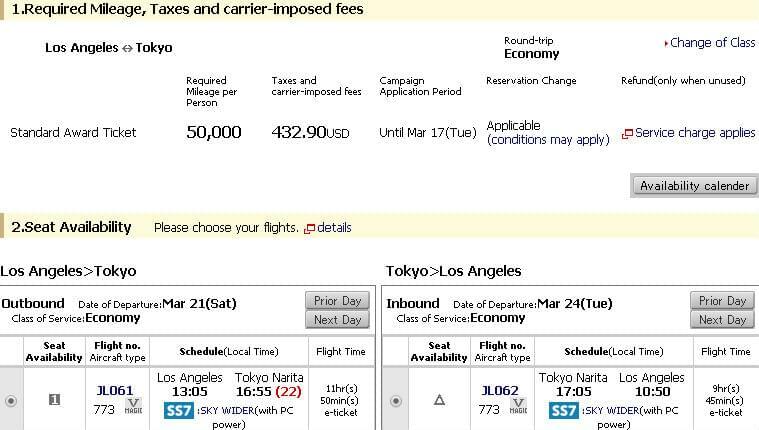 You can easily get an off-peak, economy class JAL flight between the U.S. and Japan for only 40,000 miles roundtrip. It’s theoretically possible to get an even cheaper ticket at 35,000 miles, but those are extremely hard to find. For 2015, flights from the U.S. and Japan between January 7 and February 28 are valid for off-peak redemption rates. The dates are roughly the same for next year, running from January 4 to February 29. Until the change happens, you still have the chance to fly to Japan in business class for 80,000 miles roundtrip. By comparison, this is almost as much as United charges for a one-way trip to Japan. Although JAL recently reduced their fuel surcharges, they are still considerable. For example, you’ll be charged over $400 in taxes and fees for an award flight from New York and Tokyo. However, 80,000 miles roundtrip is probably the lowest redemption rate you will find on this route for a business class seat. Another bonus for flying business class with JAL is that they don’t charge more in fuel surcharges for premium cabins (British Airways does, for example). While you can’t currently redeem miles for one-way travel with JAL, you will be able to get a one-way ticket for half miles starting April 1, 2015. They will only be bookable over the phone, though. 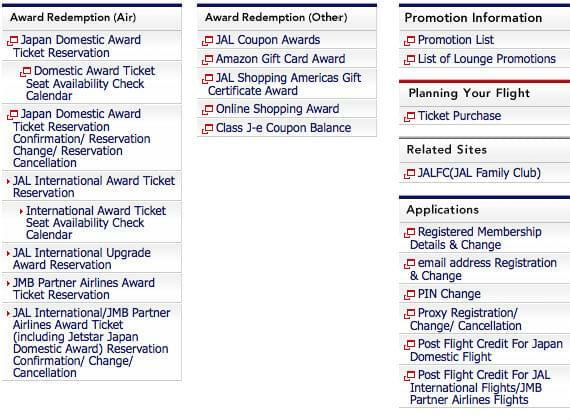 You must be a JAL member to search for an award, but you don’t have to have any miles in your account. You can join for free here. If you plan on taking advantage of JAL’s free stopovers, you’ll have to click on one of the two “reserve this itinerary” options at the bottom of the search screen. All stopovers have to be in Japan. One option is for a final destination within Japan, and the other is for a final destination outside of Japan. 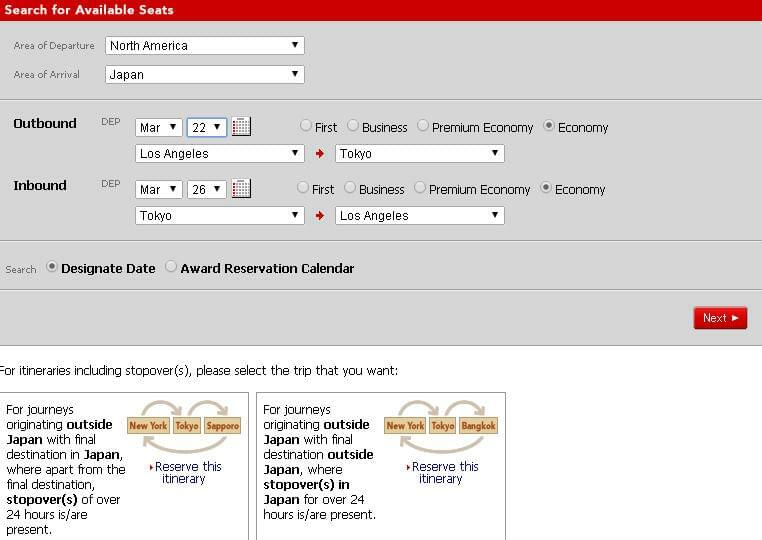 You can also check availability on JAL award flights before booking by using the fifth option on the list, “international award ticket seat availability check calendar.” Unfortunately, the interactive calendar can be difficult to use and decipher. 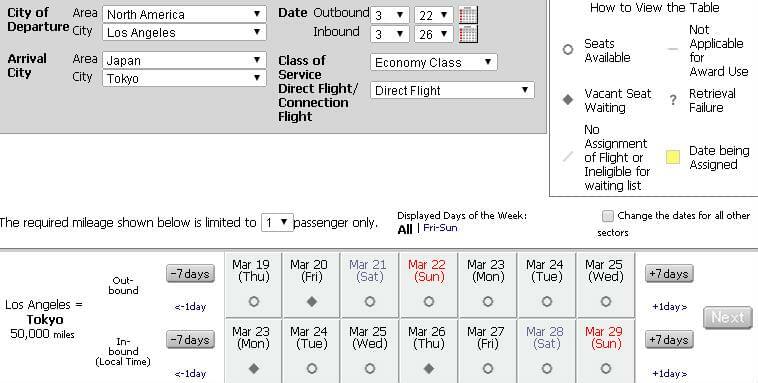 It’s probably easier to just use the “award reservation calendar” in the booking interface to check for availability. Note that in the upper right hand corner it says that if the partner airline is not listed, you’ll have to call the JMB reservation desk. Even for the partners that are listed, the JMB online partner booking is not the easiest to use. For example, there are no pull down menus for available airports for each partner airline. So you’ll have to know in advance which airlines fly to which destinations before even being able to check for availability. It may be easier to call. 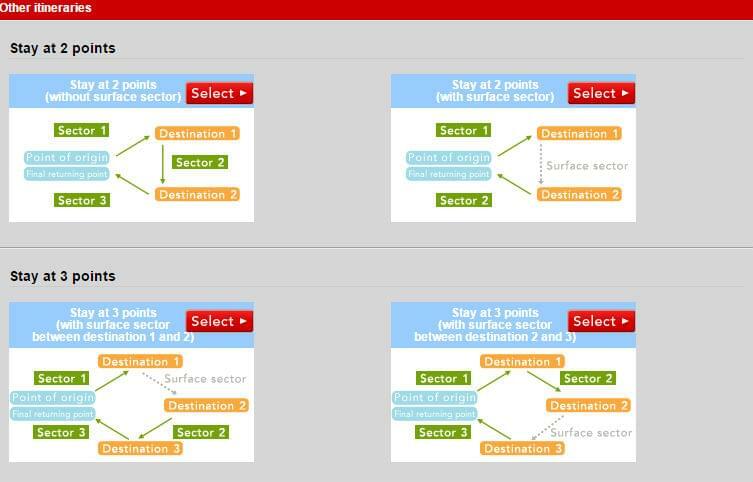 JAL’s rules about booking are complicated, but they are flexible and allow up to two stopovers and one open jaw. Taking advantage of JAL’s stopover policy can be a great way to visit more places and save miles. For example, since business class flights to Hong Kong cost about the same as direct flights to Japan, you might consider flying there with a stopover in Japan. If you have the time to visit both in one trip, you’ll save a lot of miles instead of flying to both separately. JAL’s taxes and fees are relatively high, but the redemption rates are generally very reasonable, particularly for business class flights. Keep in mind that you’ll be charged the same surcharges for flying a premium class than you will for economy. JAL’s U.S. call center is located in California. It’s open Monday through Friday from 6 a.m. to 6 p.m. Pacific Time, and 7 a.m. to 3 p.m. on weekends. While JMB is a good program with generous redemptions, they also have some complicated rules, and their website can be quirky. In many cases, especially when you are redeeming JMB miles with oneworld and other partners, you’ll have to call because the award flights won’t show up on the website. JAL agents are well-trained and easy to work with, but it’s still best to try and find an award on your own before calling.